If you search the Internet you will find some good (and some not so good) advice on how to start your nonprofit. Most of this material focuses on the legal aspects of setting up your organization and getting recognition from the IRS. While this is important, there’s a lot more to it than this paperwork. Once an organization is legally established, many founders discover a difficult reality. There are loads of regulations and best practices to follow, leaving you with precious little time to fulfill the mission of your organization. There must be a way to make this easier, right? The regulations you need to follow are not even listed in a single location. You will spend a lot of your time jumping through unanticipated hoops. Often your co-founders won’t see things the same way you do. Without a plan, starting a nonprofit can drain you emotionally. It’s important for nonprofit founders to grasp the full amount and type of work that is involved in establishing a new organization. However, even listing all the jobs that must be done involves many disparate realms of knowledge, and this is overwhelming to most people. The Nonprofit Startup School offers some free resources that make grasping the big picture easier and (dare I say?) even fun! Beyond this, I can offer valuable help to founders and groups of co-founders for a reasonable price. Lack of a shared vision can encourage apathy. Differing expectations can create inefficiency. Too often, people scramble just to get their work done. When a leader can’t share responsibility, the organization can’t scale up when it needs to. Each nonprofit is unique, so addressing these problems requires a customized solution. Nevertheless, nonprofits go through a series of relatively predictable growth stages. What works well in a scrappy young group will often be counterproductive in a more established and successful organization. However, often the problems can be understood by reviewing what steps were skipped or glossed over in the first year, so the resources I have developed for startups can still be useful when viewed from a place of experience and turmoil. I can also assist your organization directly by providing a range of valuable services. Let’s chat, and see if I can be of help in your situation. I am Richard Seymour (not the football player from South Carolina and not the Marxist writer from Ireland, both of whom I’m certain are swell guys). 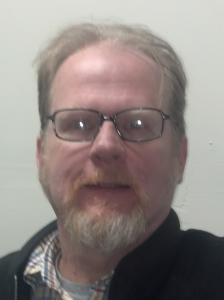 I’m the Richard Seymour who works with nonprofit organizations in Portland, Oregon. Since the 1970s I have been involved with every aspect of nonprofit creation and management. I have founded and led nonprofit organizations in Minnesota and Oregon, and have consulted with numerous nonprofits and other small, mission-driven organizations. I’ve worked with informal, all-volunteer groups as well as more established organizations. I understand the problems that new and struggling organizations face as they attempt to get off the ground and make an impact in their communities. In the 1990s I was on the staff of the Minnesota Council of Nonprofits, and am currently a member of the Nonprofit Association of Oregon as well as the Oregon chapter of the Organization Development Network. In 2000 I co-founded Free Geek, the iconic computer education, reuse, and recycling nonprofit in Portland where I wore many hats, eventually becoming the Director of Operations. I co-led this organization from its beginnings as an all-volunteer and underfunded group, through a period where we were managed collectively as our budget grew to over $1.6 million, and into its current phase in which we adopted a more traditional management structure. In 2016, striking out on my own, I founded Mahonia Consulting LLC, and through that business I have worked with a variety of nonprofit organizations in the Portland area. I am currently advising people who wish to establish their new organizations, working as an interim executive director for a small nonprofit in crisis, leading workshops, and developing online content for startup and fledgling nonprofits. I created the Nonprofit Startup School to guide founders of mission-driven organizations around and away from the pitfalls they are likely to encounter as they navigate their way through the complex maze that they find themselves in. I want to help these inspired individuals find meaningful and sustainable (that is workable) ways to channel their energy to change the world. 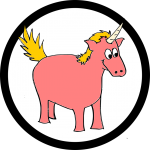 I consult with nonprofit founders, new organizations, and existing nonprofits who are experiencing trouble. Besides working in organizations that are running smoothly and efficiently, I’ve helped organizations get through some problematic transitions. That is, I do both startups and cleanups. Finally, I assist nonprofit organizations in strategic planning, systems development, integrated business and mission analysis, and change management. 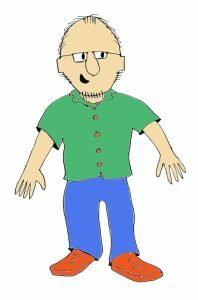 I’ve been a hippie, a geek, and a wobbly cartoonist. I’ve worked with scores of nonprofit organizations, activist groups, co-ops, and worker collectives over a career of forty-something years in both Minnesota and Oregon. I currently live in outer southeast Portland, Oregon where I volunteer at the local tool library and a neighborhood mediation service. If you’re in the Portland area, check out my meetup.com page, where you can arrange to meet me in person and find others who are actively learning what it takes to successfully create new mission-driven organizations. 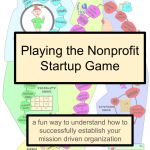 Using the metaphor of a board game, this 90 page ebook works as a stand alone introduction to the complex process of establishing a nonprofit. For would-be founders, it is an easy and fun way to grasp the big picture. For those already leading nonprofits, it works as a touchstone for the many foundational issues that are often the root of problems they are experiencing. 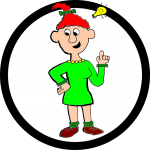 Sign up for weekly posts to receive your complimentary copy of this fun resource. The Nonprofit Startup School blog gives nonprofit founders and leaders insights and food for thought on a weekly basis. I cover a wide range of relevant topics. The Nonprofit Startup Game can be played by people who want to explore starting their own nonprofit organization or by people working in existing nonprofits. 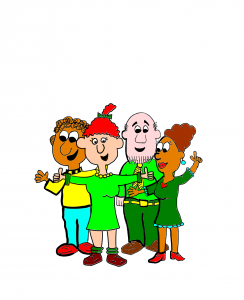 Instructions for printing the game are included with the ebook, Playing the Nonprofit Startup Game, which serves as the game’s rule book. This resource is valuable for teachers in the nonprofit management field and consultants working with fledgeling nonprofit organizations. The Nonprofit Startup School YouTube channel occasionally posts free videos. 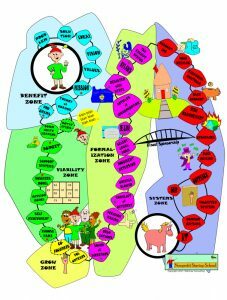 I help individuals navigate through the complex web of rules, requirements, and best practices as you establish your nonprofit organization, from clarifying your initial idea through research and feasibility testing on through incorporation, business model development, filing for tax exempt status, and establishing your support systems and programs. This can be a face to face service for people in the Portland, Oregon area. I can also work with you remotely through the magic of online video calls. I help nonprofit leaders as they face the challenges of leading a mission-driven organization. This can be a face to face service for people in the Portland, Oregon area. I can also work with you remotely through the magic of online video calls. I can work with your co-founders in a group setting, bringing people up to speed on how nonprofits are established and run. This is a face to face service for people in the Portland, Oregon area only. When you find a gap in your leadership that needs to be filled temporarily, I can help. I work from the Portland, Oregon area, but have helped national organizations that are capable of being supported remotely. I can facilitate your founding meetings and retreats. This is a face to face service for people in the Portland, Oregon area only. I work in a visual, inclusive style and I try to build real consensus even when people don’t seem to be on the same page. My approach is informed by my experience with organizational change, negotiation, and mediation. Every nonprofit needs to think and act strategically. I can help you identify strategic goals and objectives, and work with you to form a plan to make them really work in your organization. I can work with your group clarify its mission, vision, and values. This is a face to face service for people in the Portland, Oregon area only. As a nonprofit forms and grows its leaders often find that the basic support systems are insufficient or altogether lacking. I can work with your to develop accounting systems, select IT solutions, establish HR policies, and other operational needs. I work with you to build the capacity within your organization to grow and maintain these systems so you do not need to rely on outside consultants. Richard, Your facilitation style was a perfect mix of letting the conversation to take us organically to places we needed to go while balancing it against a schedule to keep us moving forward through the agenda. No small feat! We got a lot done in a relatively short amount of time. I serve as a board member for a local nonprofit. Richard has been involved with our organization for about a year now to help with some major organizational shifts. The expertise and guidance he has provided (plus his simpatico nature!) have proven invaluable at such a critical time. I feel privileged that he has been able to lend his skills to our organization. From the reports to the board he provides to the 990s, he has made this process a lot less daunting. I jumped into the nonprofit world thinking I would pick it up as I went along, and it turns out there’s a lot more to it. I highly recommend Mahonia Consulting!! Richard facilitated a visioning session for my favorite professional group. He was organized, articulate and kept us on track. We now know where we want to go and what the next steps are to get us there. They say a good facilitator is worth their weight in gold. Richard proves this to be true with his great facilitation skills. He led our nonprofit through an excellent visioning session and was able to balance the voices in the room, direct the conversation to be productive, and ensure everyone was heard. Thanks again! Richard has been invaluable to our organization when we were left without an Executive Director nine months ago. He has helped the board navigate the organization through financial and legal hurdles, and has worked closely with the Oregon Department of Justice and IRS in making sense out of a poorly maintained financial system. Richard, Thank you for all your support, expertise, and willingness to sort through my situation and in a calm manner provide a path forward that was doable. I just met with the board and we have made changes and are in alignment with our policies and procedures. Richard facilitated our visioning with kindness and focus. He created the space and the process for everyone to speak and be heard. Even in moments of tension, he helped the group move forward. If your nonprofit includes passionate people I’d definitely recommend using Richard as a facilitator. Richard came to our organization when it was literally in shambles. We didn’t even know what questions to ask, never mind where to look for the answers. Richard never wavered as he calmly and quickly sorted through each issue. His knowledge of the nonprofit world has been invaluable. He has worked to correct many legal and ethical issues that were plaguing our organization. His high level of professionalism as well as his diplomatic nature has served us well as he has worked with other agencies on our behalf, including the Department of Justice and IRS. My only regret is that we did not have Richard as a member of our team years ago.